Companies such as Uber, Lyft, General Motors and Toyota have spent billions of dollars in the past few years developing what we now know as “self-driving” cars with belief that the technology would lead to an industry worth trillions. While this technological development has wowed people all over the world, it’s not quite foolproof. 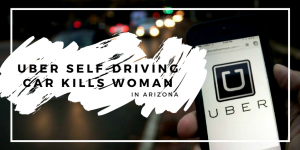 In Tempe, Arizona, a woman was walking her bike across the street when she was struck and killed by a self-driving Uber car on March 17th. The car involved in the accident was a Volvo XC90 sport utility vehicle that was equipped with Uber’s sensing technology. When the car struck pedestrian Elaine Herzberg, it was going 40 miles per hour in a 45 MPH zone. According to police, the car was operating in autonomous mode and did not slow down prior to impact. Check out New York Times for more. Uber released a statement saying that they are “fully cooperating with local authorities,” and that “safety is the primary concern every step of the way” as they continue to develop self-driving technology. They have temporarily halted it’s testing of self-driving vehicles, as is it’s policy following any accident. It is unknown when these operations will resume. 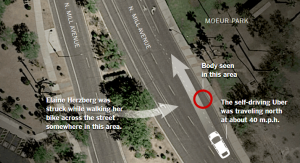 Elaine Herzberg’s death is the first known pedestrian death involving a self-driving car. The local police department is investigating the crash and has not determined whom was at fault. Supporters of the technology claim that self-driving vehicles are supposed to drastically reduce the number of automobile accidents. However, it’s too soon to tell how this accident will effect the business aspect of Uber or the pace of progress in the movement for self-driving vehicles.